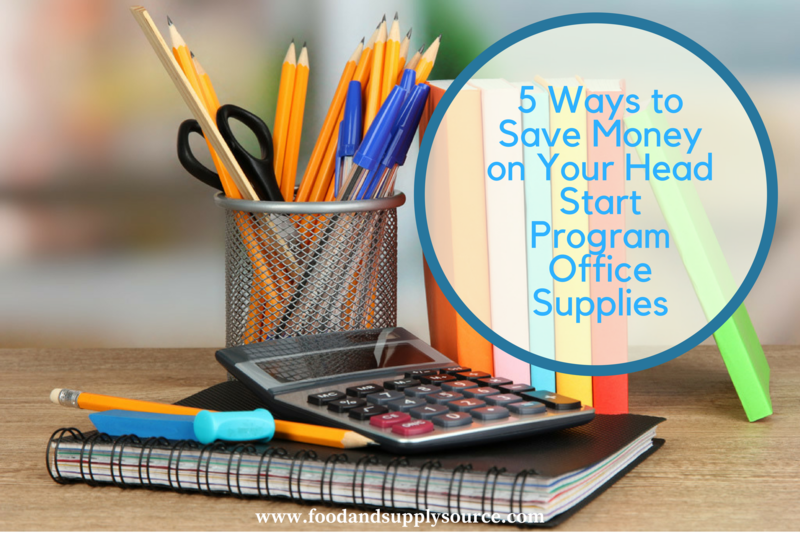 With so many Head Start programs scrambling to save money in their budgets in order to keep the programs open and available to children and families in-need, one of the first places you can start saving money right away is in the purchasing of office supplies. Believe it or not, billions of dollars are spent each year by businesses in the United States on office supplies. If you do not learn how to control these expenditures, they can begin to add up very quickly. This article will focus on the five top ways that Head Start programs can reduce office supply costs so they can invest instead into the educational and nutritional aspects of this very valuable community service. While some may seem common sense, they are worth mentioning because when you are overwhelmed with the management and operation of a program like Head Start, it can be easy to forget some of these basic cost-saving methods. This cost-saving method for Head Start programs is something that we can apply to many different areas of our lives. Learning to sort out the “nice to have” list from the “have to have” list can make budgeting a breeze. Every time you make a list for purchasing office supplies, separate it into two columns of what is really needed and what you would like to have to make things easier. Some of the office supplies that we purchase are really not necessary. Other things, such as paper, pens, copy paper, ink and paper clips are much more practical. Separating your list by importance can be a great way to reduce office supply costs. While it can be a bit time consuming to compare prices when purchasing office supplies, studies show that you can reduce office supply costs by as much as 25 percent just by taking time to compare prices. A lot of this work can be done online or by keeping track of sale ads at your local office supply company. Just make sure that you also factor in shipping costs for online purchases and that you make time to visit your local office supply store instead of ordering them for delivery to maximize your cost-saving methods. Most Head Start programs purchase the same amount of office supplies each and every month or spread their expenses evenly throughout the school year. Purchasing your supplies from known suppliers with set pricing can help you stick to your budget. Negotiating better prices with a supplier can be a bit tricky, especially if you don’t have experience working with suppliers in this way, but it can really help you to reduce office supply costs on the things you buy the most. Buying your supplies in bulk at one time or once each quarter can help you to save money and can earn you discounts. There are many companies that will help you reduce office supply costs by selling to you in bulk even if you are just a small business. This can be really helpful to Head Start programs who often have to go it alone and are unable to network with other Head Starts in their area for better pricing. If you buy all of the copy paper that you will need for the year at once, chances are you will get it at a considerable reduction. The same goes for other paper products, such as toilet paper, tissues and paper towels that are ordered for your janitorial department. This is perhaps the easiest and most cost-saving method of them all! Supply Source Plus is a free program available to Head Start programs as a means of reducing office supply costs and costs for janitorial supplies. They also provide discounted cost-saving methods for accounting and background check services that are vital to the success of any Head Start program. You can get the best prices from a huge network of suppliers and save money every time you purchase office supplies through Supply Source Plus. When you contact Supply Source Plus to help reduce office supply costs for your Head Start program, we begin with a comprehensive evaluation of your current office supply purchasing procedures and habits. We will provide you with collected information about your current cost-saving methods and help you implement even more ideas for saving on purchasing office supplies. Supply Source Plus works with a network of pre-vetted suppliers to help improve not only the cost-saving methods available, but also to improve the comfort of our clients in knowing that they are working with businesses that value customer service and quality control. Let Supply Source Plus be your Head Start program’s one-stop shopping experience, providing you with all of the office supplies you need at a price that your budget can allow. Call today for your free evaluation!